Trump started a joke, but do we want to hear the punchline? 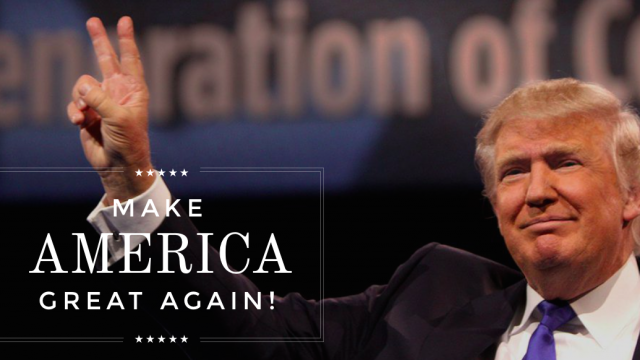 Donald Trump is now the leading Republican presidential candidate. Exactly how did this happen? Rob Idol has a theory. Let’s talk about everyone’s favourite hairpiece, Donald John Trump. He’s rich, famous and ruthless. The man who makes our own Tony Abbott look like a tolerant, sensitive new age guy has his eyes on the most powerful position in the free world, the Presidency of the United States. While most of us are waiting for the punchline, he’s left us gobsmacked by taking a formidable lead in the Republican candidacy race. When this was announced I had a quiet chuckle to myself. His reputation precedes him as the personification of every terrible rich white male stereotype. No cause for alarm; surely the Sarah Palin experiment was enough for the Republican Party members to have learned their lesson. He’s just going to give us some offensively entertaining sound bites while they quietly usher the next Bush to the leadership (bad things usually come in threes after all). When asked about his well-publicised misogyny including referring to women he didn’t like as “fat pigs, dogs, slobs and disgusting animals” as well as his famous statement to a female contestant on Celebrity Apprentice suggesting that “It would be a pretty picture to see her on her knees”, he brushed it off suggesting that he doesn’t have time for political correctness, and neither does his country. When the panel were asked if any of them would stand as an independent in the election should they not be elected to the GOP leadership, a lonely, but confident Trump hand shot up. He sent a strong message to the GOP faithful that the party is nothing but a vehicle for his own ambitions and he is going for this with or without them. As far as Trumpisms go, these were admittedly mild statements. After all, this is a man that has suggested that global warming was created by the Chinese to kill American manufacturing. When discussing his likely Democratic opponent in Hillary Clinton, he said: “If Hillary Clinton can’t satisfy her husband what makes her think she can satisfy America?” Or, four days after proudly declaring on Entertainment Tonight that “he doesn’t have a racist bone in his body”, he tweeted about his Republican opponent, Jeb Bush with this absolute doozy “Jeb Bush has to like the Mexican illegals because of his wife”. You can understand why the initial reaction to his nomination was a nervous chuckle. The absurdity of this situation is really no laughing matter. The position of President of the United States has significant influence well beyond the geographical boundaries of the US. It is a position that requires intelligence, diplomacy and a hell of a lot of balance. At a time when the United States appears to be moving forward in leaps and bounds on many important social issues, even the remote chance that the world’s most famous comb-over could set up residence in the Oval Office should put the globe at DEFCON 1. One thing can’t be denied is that Trump is one hell of a salesman. He has forged out a long, successful, career selling his own brand. His success thus far in the Republican race is a direct extension of that salesmanship. He knows what the party faithful want to hear and he’s feeding it to them on a silver, Trumped up platter. Is it as clear cut as that? It has been suggested that Trump is, in fact, a double agent running a false flag campaign on behalf of Hillary Clinton. This is a suggestion that would normally be filed away with your tin-foil hat or in a popular subreddit, but it would certainly explain the absurdity of what we are witnessing. Trump does have a long-standing relationship with the Clinton family, donating hundreds of thousands of dollars to various Clinton concerns including Hillary’s own 2008 Presidential Campaign. He has also been unashamedly public about his admiration for Bill Clinton and was allegedly encouraged directly by Bill himself to run on the Republican ticket. Add to this that Trump has in the past been a registered Democrat and voted for them on a number of occasions. In fairness, he has flip-flopped between both parties previouly, but was registered as a Democrat as recently as 2008. He has also publicly supported pro-choice rights and even universal health care in the past; hardly staple positions of the Conservative Republican Leader he is selling us now. He has changed his tune on both, which we are all entitled to do, of course, but at the very least it adds a little credence to what should be an outlandish theory. We may never know the truth. In the meantime, however, we can watch the show playing out before our eyes. Until the show becomes reality and the laughter stops – because the joke is no longer funny, and it’s on us.